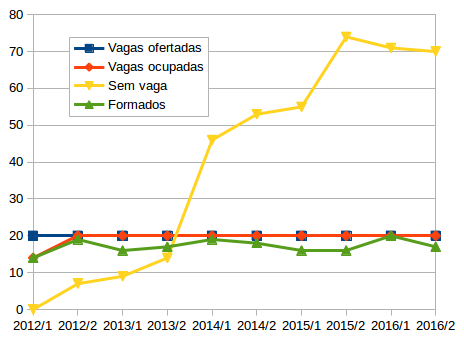 Plot 1 – Offered vacancies (blue), occupied (orange), non-vacancy students (yellow) and permaculturists certified (green). In 2011, twenty two permaculturists from six Brazilan biomes had a meeting at Florianópolis, reviewed the 80’s Bill Mollison PDC Syllabus. 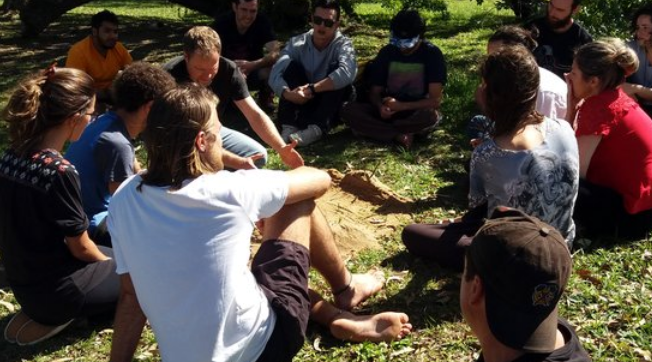 The purpose of it meeting was create a updated Permaculture Design Course curriculum to share with people, ways to live in harmony with nature, using the permaculture philosophy. This meeting creates an updated program based in how energies flows in the landscape, that inspires the creation of “introduction to permaculture” discipline at UFSC Geography undergraduate program. 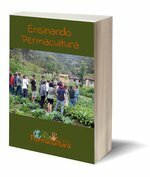 This discipline was the start point of permaculture activities at UFSC and it be offered for the first time in 2012 and come to it 10th edition in 2016. 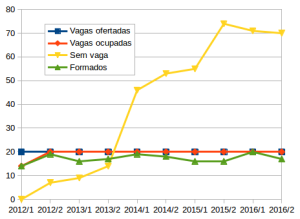 Since it second edition, the discipline demand to attend overpass the vacancies capacity. It had created a surprise between professors evolved in it development. Students from different UFSC programs began how to participate to insert the PDC formation as an additional activity in their professional curriculum. Based in this scenery, since fourth edition (2013/2) the procedure to receive students from other programs and external people was adopted. This action generated an increase of people interested into participate, more clearly in 2014/1 ascension curve (Plot 1). 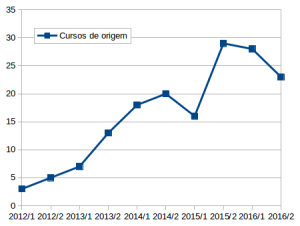 An important behaviour to cite is the amount of over 75% (Plot 1) of students certified each semester, showing the interest of students for the theme. Plot 2 -Diversity of programs from where students come from and have interested to attend the Introduction to Permaculture discipline. 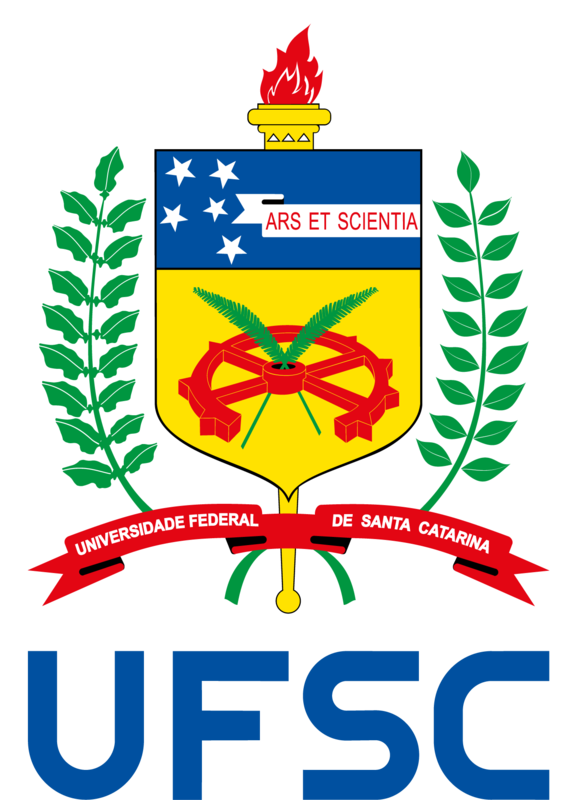 Furthermore, the group of professors evolved in this discipline aim to develop research and extension activities at UFSC. Thus, this group had create the Permaculture Study Group (NEPerma). that start its activities in August of 2013 together of Environmental Analysis Laboratory. In 2013, NEPerma starts the The UFSC woodland environmental restoration project , planned by sectors end energetic zones, using techniques of cultivated ecology in the process. This project follows nowadays and have offered to the academic community, as well as to the neighbourhood, the opportunity to comprehends better how to interact right with nature. In the same year, NEPerma starts too the Permaculture at School project [in Portuguese], which purpose to lead environmental education to primary schools of Florianópolis by permaculture point of view. In 2014, NEPerma start to develop Permanent Land project [in Portuguese], which objective to share permaculture knowledges with rural extensionists and small farmers around Florianópolis region. The project was concluded in 2016 and have certified 34 permaculturists by presential and virtual teaching. PermaChico was a project developed in association with young seminarians and monges of Paraná State (southern Brazil). This initiative become strong the relationship between both to environmental questions. Furthermore, the NEPerma’s permaculturists team made a lot of audio-visual materials to teach at distance the Permanent Land PDC. This material can be accessed for free. As complementary activities, two documentaries were subtitled to Brazilian Portuguese, Seeds of permaculture and The voice of the wind. These actions aims facilitate the understand about permaculture and sustainability to Brazilian people. At the same time, NEPerma was concluded three Geography Program Conclusion Monograph and follow developing a doctoral thesis, what objectives a better comprehension how permaculture can stimulate permaculturists to live in countryside way, changing cities by rural areas. Teaching landscape reading for students of the last class. Nowadays, the NEPerma’s professors are working to create a Permaculture Program at UFSC, discussing about time duration, disciplines and entire of activities important to educate permaculture. This program aims to form citizens capable to act into natural resources management, generalists in their academic education, with technical-scientific knowledge and social views to absorb and develop new technologies and methods according to human specie permanence on Earth. We are only starting activities. The next 5 years are welcome!